Image credit: ‘Shakespeare’s Binding Language’ by John Kerrigan. Published by Oxford University Press. 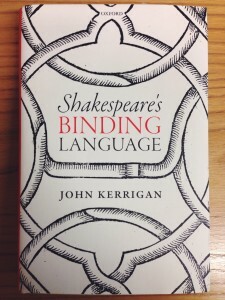 John Kerrigan’s book Shakespeare’s Binding Language has won the 2016 Roland H. Bainton Book Prize in Literature. The award ceremony takes place at the Sixteenth Century Society and Conference, 26-29 October, Milwaukee, Wisconsin.